9/89. West Bloomfield, Michigan. 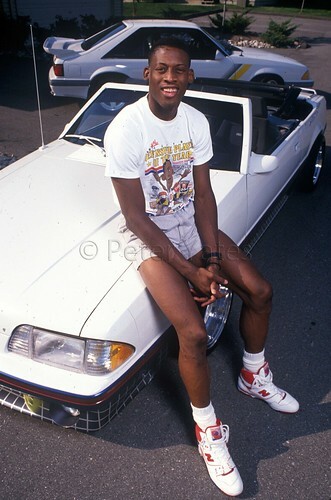 Dennis Rodman of the Detroit Pistons at home with his customized Mustangs.The convertible has only one seat, the rest of the car, including the trunk, is taken upi with a 3500 watt sound system, a VCR, television and cellular phone. Photo by Peter Yates.